Traditionell sind es die Mitarbeiter, die gute – oder zumindest glückliche – Entscheidungen treffen, die die Karriereleiter innerhalb von Unternehmen erklimmen. Und diese Kultur des Respekts gegenüber guten Instinkten durchdringt auch heutzutage noch die Entscheidungsfindung in vielen Unternehmen. In manchen Fällen werden Berater hinzugezogen, um unliebsamen oder rein präferentiellen Entscheidungen den Anschein externer Validierung zu geben; in anderen Fällen verlässt man sich auf die Weisheit von Vorgesetzten, Mentoren oder Gurus. Es zeichnet sich jedoch ab, dass bei Entscheidungen, die ein Unternehmen von sich aus nicht ohne weiteres unterstützen kann, immer mehr das Kollektiv herangezogen wird und man sich bei Entscheidungsfindung und Problemlösung der Kraft großer Zahlen bedient. In unserer digital vernetzten Welt fallen jeden Tag Unmengen von Daten an (siehe Abbildung 1). 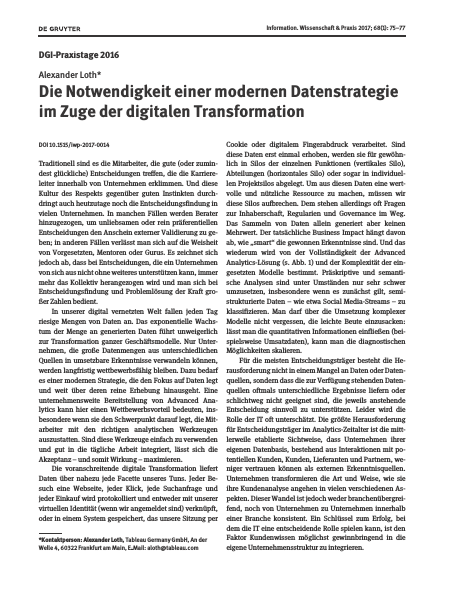 Das exponentielle Wachstum der Menge an generierten Daten führt unweigerlich zur digitalen Transformation ganzer Geschäftsmodelle. Nur Unternehmen, die große Datenmengen aus unterschiedlichen Quellen in umsetzbare Erkenntnisse verwandeln können, werden langfristig wettbewerbsfähig bleiben. Dazu bedarf es einer modernen Strategie, die den Fokus auf Daten legt und weit über deren reine Erhebung hinausgeht. Eine unternehmensweite Bereitstellung von Advanced Analytics und Data Science as a Service (DSaaS) kann hier einen Wettbewerbsvorteil bedeuten, insbesondere wenn sie den Schwerpunkt darauf legt, die Mitarbeiter mit den richtigen analytischen Werkzeugen auszustatten. Sind diese Werkzeuge einfach zu verwenden und gut in die tägliche Arbeit integriert, lässt sich die Akzeptanz – und somit Wirkung – maximieren. Teil 2: Steigern smarte Erkenntnisse den Business Impact? Teil 4: Wie unterstützen Analysen Ihre Entscheidungsfindung? Teil 5: Erstickt Innovation zwischen Berichtswesen und Data Discovery? During the Q&A session of a recent talk on Data Strategy, I was challenged with a rather technical question: I was asked how to identify the variables that are heavily influencing a certain measure – with an interactive solution that matches a modern data strategy as suggested in my presentation. Of course, this could be done by executing a script. The result however would be static and it would be not convenient for a Business Analyst to run it over and over again. Instead of applying a script every time the data changes, it would be much more innovative to get the answer immediately with every data update or interactivity such as a changed filter. So why not solve this with Tableau? The magic underneath this easy-to-use Tableau dashboard is a nifty R script, embedded in a calculated field. This script calls a statistical method known as Random Forest, a sophisticated machine learning technique used to rank the importance of variables as described in Leo Breiman’s original paper. Does your enterprise manage data as corporate asset? Many companies don’t. 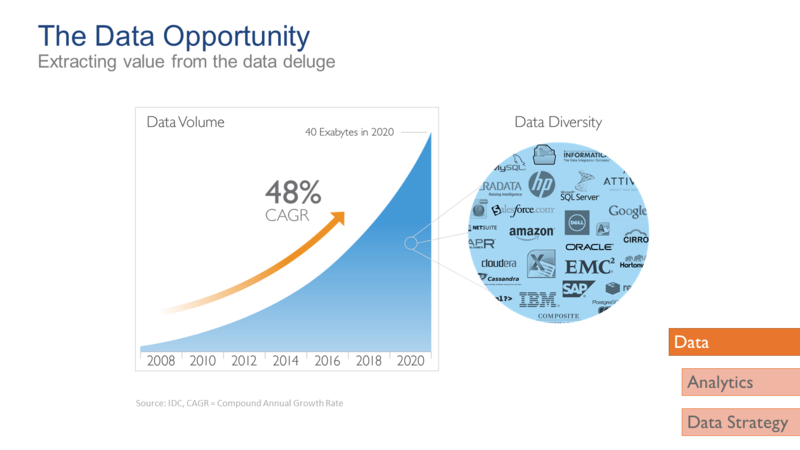 Here’s how to get started with the three core elements for your Data Strategy Plan. The ongoing digital transformation of our environment has created an enormous amount of data about just every aspect of what we are doing. Every website we visit, every link we click, every search engine term, every purchase is recorded associated either with our online identity if we have logged in, or in a system that saves our session through cookies or digital fingerprinting. Once gathered, data across the enterprise are typically stored in silos belonging to business functions (vertical silos), business units (horizontal silos), or even different projects within the same division (segmented silo). Making this data a valuable and useful asset will require to break down the silos. This may not be so easy to accomplish, due to ownership issues, regulatory concerns, and governance practices. Collecting data alone does not generate value. 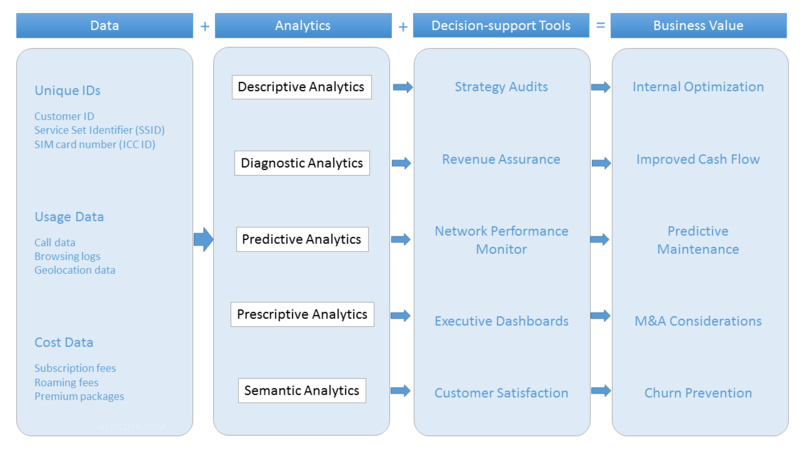 The completeness of your Advanced Analytics stack and the complexity of the applied models determine how “smart” your insights will be and therefore how deep the level of business impact will get. Prescriptive and Semantic Analytics might be tough to implement, especially, if you need to find a way to classify semi-structured data, such as social media streams. While you look to apply sophisticated models, you should not forget to collect the low-hanging fruits, and see if you put in all your quantitative information, such as revenue data, to scale out your diagnostic capabilities. Now you need intuitive tools that integrate data into sustainable processes and apply your analytic models to generate information that can be used for your business decisions. Depending on the stakeholder, the outcome might be presented as a self service web front end, such as a Network Performance Monitor that allows predictive maintenance, or an Executive dashboard that provides your CFO the latest numbers for upcoming M&A. An important consideration for your decision-support tools is user acceptance. Decision-support tools should be easy to use and should not make processes more complicated. Instead, consider to add buttons that trigger actions directly from the user interface. This content is part of the session “3 Essential Components to building a Data Strategy” that I delivered at Telekom Big Data Days 2016. Have a look on my upcoming sessions!